My friends had asked me where to buy cheaper Bibles in Thailand. I have compared bookstore prices and LAZADA Thailand prices and I found out that LAZADA is a way cheaper. @ LAZADA Thailand the price is only 1,215 baht (10% discount) with FREE shipping. 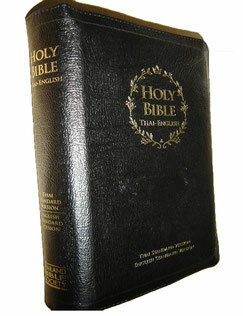 Thailand Bible Society (TBS) has a page @ LAZADA site. Click here check out the prices there.